Outer Banks vacationers may come for the gorgeous beaches, but often they come back again and again for the attractions and activities off the sand. Because of the Outer Banks' mixture of natural landscapes and historical attractions, one of the best ways to truly explore this 150 mile stretch of North Carolina shoreline is on bicycle. 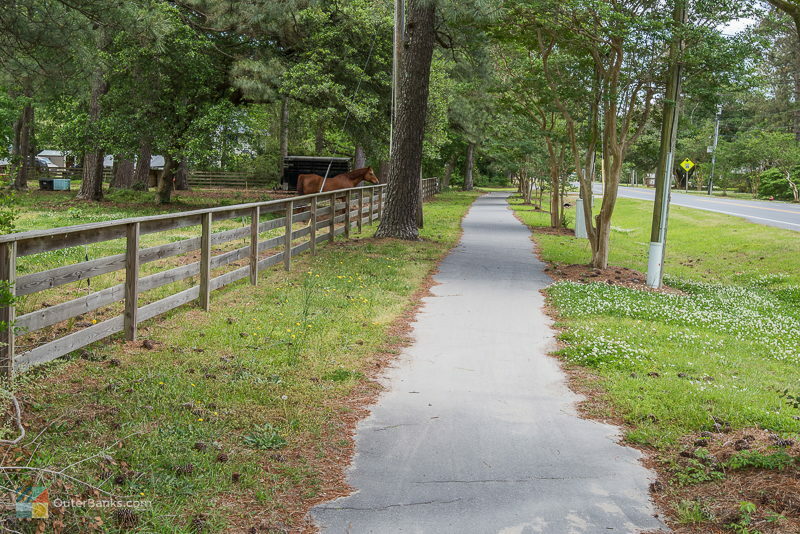 From Corolla to Ocracoke, the Outer Banks is incredibly bike-friendly offering multiple paths through scenic trails and paved right-of-ways through more congested areas. Weekly or afternoon rentals are available in almost every community, and bikers have their choice of riding by the shore, through the maritime forests, or just cruising around town. From a family expedition to a trek along all 150 miles of the coastal Outer Banks, on your next vacation, you'll find plenty of opportunities to put the pedal to the medal. 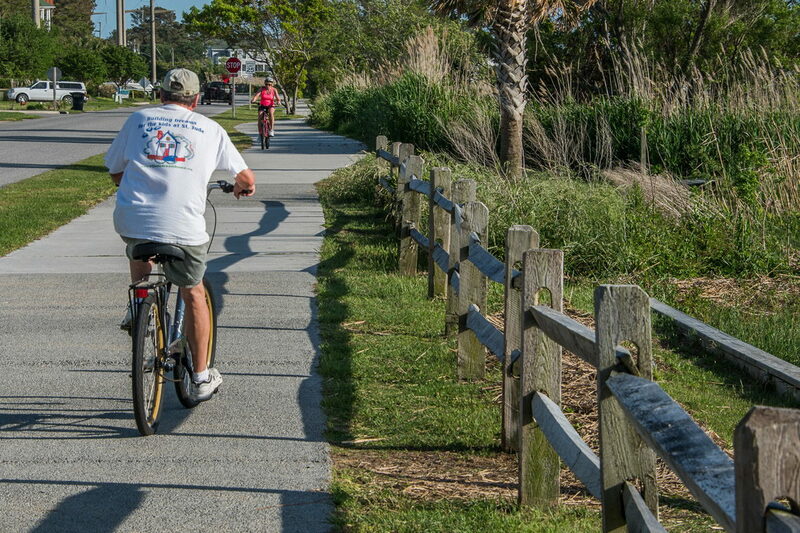 No matter where you stay along the Outer Banks, there are plenty of well-marked bike paths and off the beaten path trails to explore. You'll notice along every stretch of road, from NC Highway 12 to the Hwy 158 beach bypass, a number of yellow caution signs urging drivers to "Share the Road." As the vacationing population has expanded over the years, so has the need for better bike paths, and many local communities has responded by creating a network of paths and trails offering convenient access to many of the area's favorite attractions. 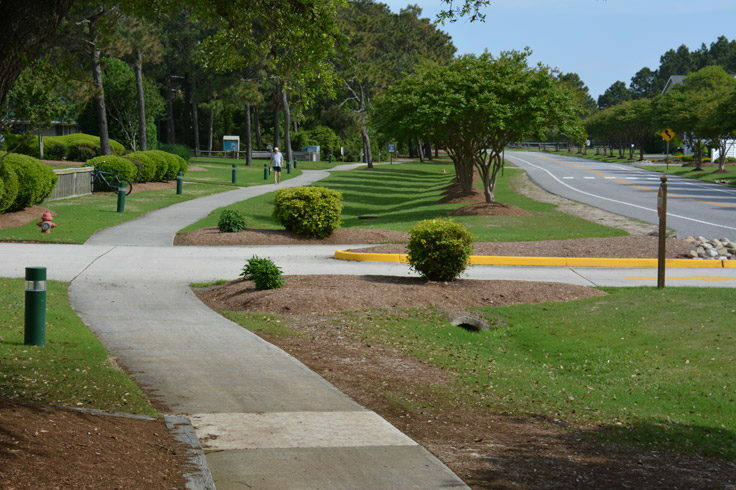 Corolla: In the town of Corolla, vacationers can cruise a 3 ft. - 6 ft. paved bike path that covers around 10 miles throughout the town. This makes it easy for cyclists to circle by the area's favorite attractions, such as the Currituck Beach Lighthouse, The Whalehead in Historic Corolla, the Outer Banks Center for Wildlife Education, and the Pine Island Audubon Sanctuary. 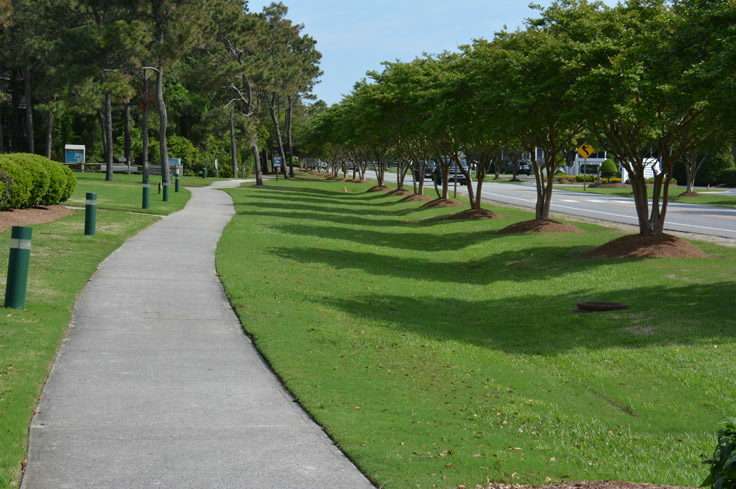 Duck / Southern Shores: These two towns also offer 10 miles of paved paths that run parallel to NC Highway 12, but with a significant grassy buffer allowing bikers a safe cruise down the road. 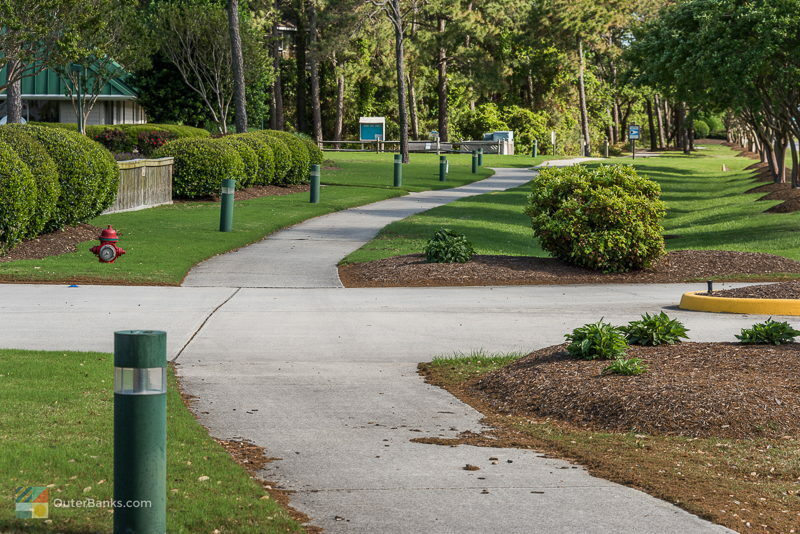 Shaded by love oaks and cedars, the paths also provide cyclists with easy access to area shops and restaurants, and quick access to the beach. Kitty Hawk / Kill Devil Hills: Venture off the beach road or the bike paths that border the busy Hwy 158 bypass, and you'll discover a world of trails that wind through Kitty Hawk and Kill Devil Hills and provide a unique tour of some of the area's more undiscovered areas. 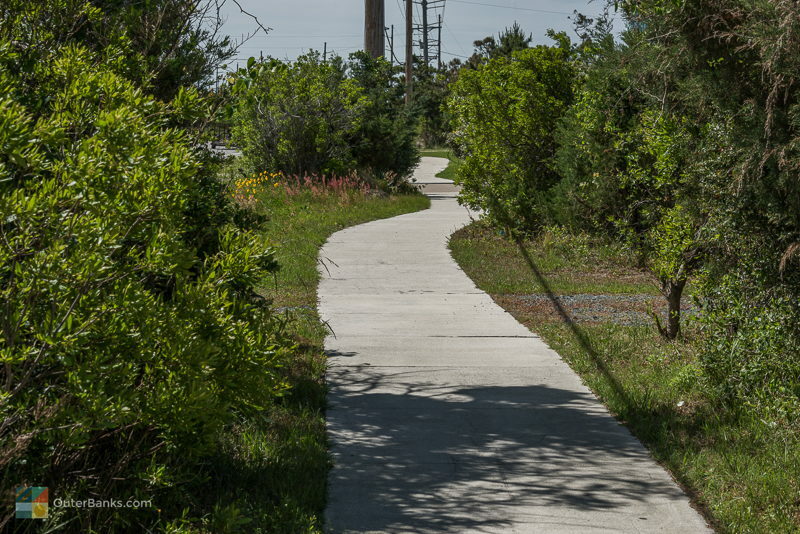 In Kitty Hawk, a soundside bike path runs right through the Kitty Hawk Coastal Reserve, and in Kill Devil Hills, bikers will find a long path that circles the Wright Brothers Memorial and continues along the Park Service land border. 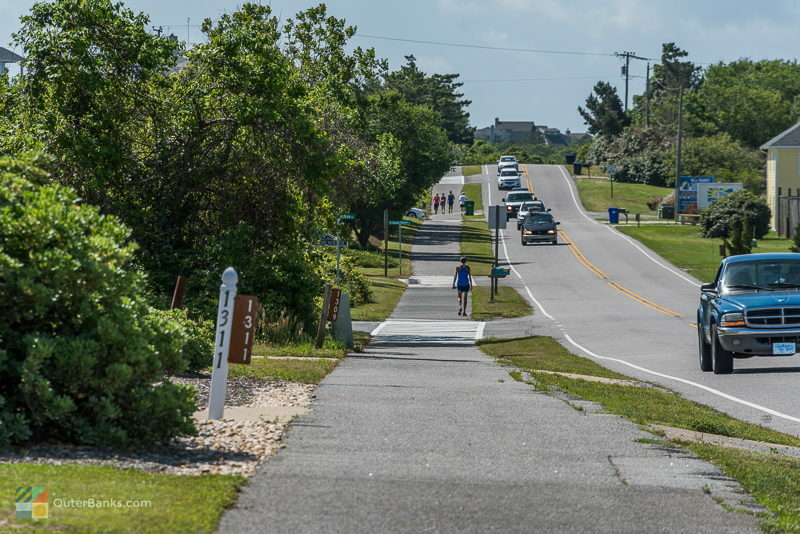 Along quiet residential areas, like Kitty Hawk Woods, vacationers will find bike path shortcuts that link the villages of Southern Shores, Kitty Hawk, and even Kill Devil Hills, giving cyclists even more reasons to explore. Nags Head: An 11 mile path runs the length of the town, but more advanced riders may want to test their rough terrain skills through the nature trails at Jockey's Ridge State Park (fat tire bike recommended for soft sand). For a seaside ride, head to the quieter, two lane South Nags Head area, and enjoy a bike ride bordered by the Atlantic Ocean and a line of quaint vacation rental homes. Manteo: Manteo may be one of the best areas to explore on bike, as there are literally dozens of avenues to explore. Alongside the main road, cyclists can cruise a nice wide path off the highway. This ride is exceptional in the summer and early fall, when miles of Crepe Myrtles that serve as a border between the highway and the bike path are in full bloom. Bikers can also take a side trip through downtown Manteo to get a closer look and the dozens of historic homes with gorgeous gardens, and waterfront shops and attractions. Cruise over the wooden bridge in downtown Manteo for a close-up view of the Elizabeth II, and a waterfront detour. Pea Island: Long distance cyclists love to tackle the 13 mile stretch between the Bonner Bridge and the northern Hatteras Island town of Rodanthe, known as the Pea Island Wildlife Refuge. 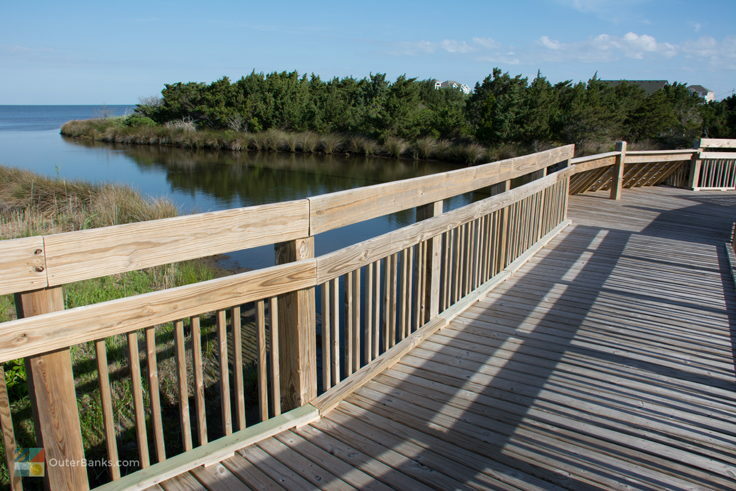 Though there are limited outposts available - just one rest area with bathrooms and water fountains along the entire stretch - the payoff for this ride is miles of secluded marshlands and ocean views peaking over the dune line. Seasonal cyclists will also spot dozens of bird species, including geese, ducks, herons, egrets, and occasional white pelicans - one of the rarer birds that frequent this area. 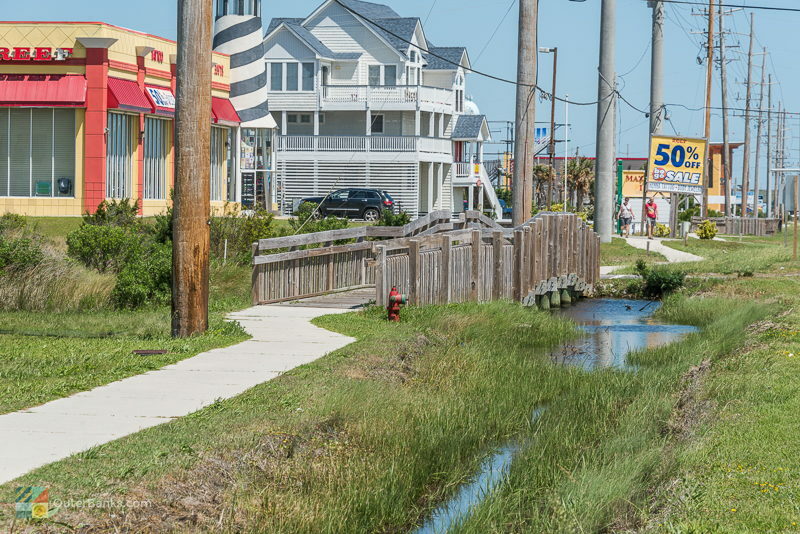 Rodanthe / Waves / Salvo: A bike path borders NC Highway 12 so cyclists can explore the length of the tri-villages. 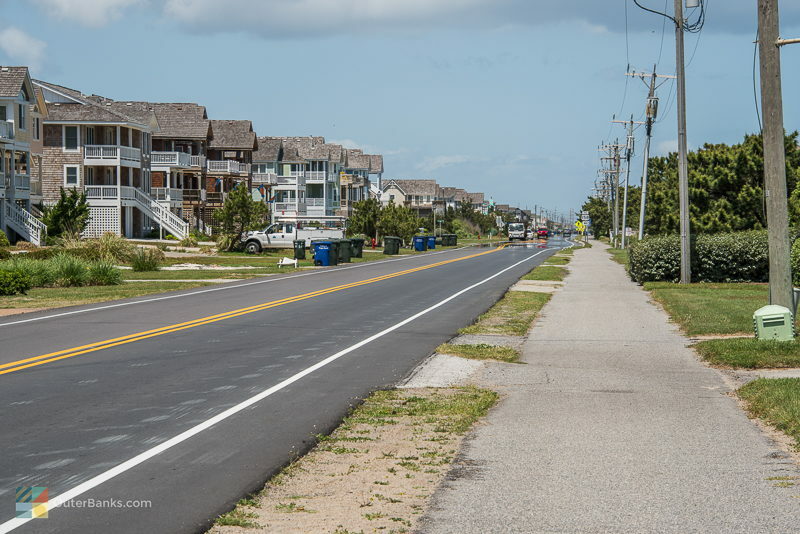 The bike path directly abuts the highway, but fortunately, Hatteras Island has an island-wide law that passing on the right is not allowed by motorists, and signs are posted to this effect throughout the island. Leisurely bikers in the tri-villages might enjoy exploring the residential roads that veer off the highway, particularly Colony Drive, which is a parallel loop to Highway 12, and borders the oceanfront. Buxton and Frisco: Vacationers who want a variety of bike paths and trails to explore will love all the trails that Buxton and Frisco have to offer. A wide bike path runs off of Highway 12 through Buxton Back Road, and the long paved road towards the Cape Hatteras Lighthouse and the ramp to Cape Point is perfect for bikers who want to check out one of Hatteras Island's most treasured attractions. Off the main drag, bikers can explore an intricate series of trails that trickle in and out of Buxton and Frisco Woods, one of the country's largest maritime forests. Have fun exploring, but be sure and bring plenty of water and bug spray - on these grassy paths, it's not unusual to be the only human around for miles. Hatteras: Bikers can cruise along the highway, or take a short cut on Eagle Pass Road to get a fresh view of the marshes and ponds that lie along the back roads of Hatteras. There's also a small nature trail in this area, ideal for exploring on foot or on a bike. Turn right past the lemon yellow Weather Station, and enjoy a self-guided tour of "Old Hatteras," a collection of residential historic homes protected by live oaks draped with Spanish moss. Ocracoke: Where can you enjoy a bike ride on Ocracoke Island? Just about everywhere! 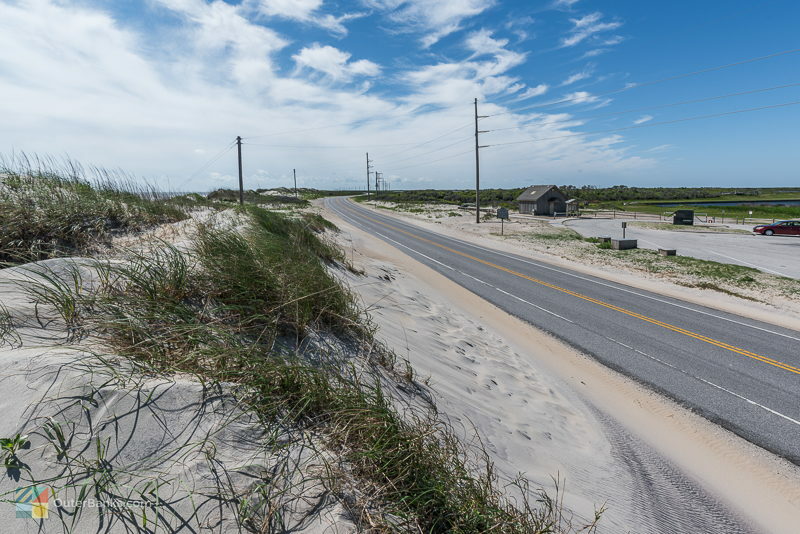 The 13 miles of highway between the Hatteras Inlet and the town of Ocracoke's border is relatively untraveled, and featured a narrow bike path that twists and turns through sandy oceanfront landscapes, small creeks, and clusters of maritime forests. You'll find a couple nature trails along the way for in-depth exploring as well. In the village, bikes are everywhere, as a bike is one of the easiest ways to explore the 4 square miles of Ocracoke proper. On a bike, it's easy to cruise by the Ocracoke Island Lighthouse, the British Cemetery, ir pull up to a local restaurant for a quick bite. You'll notice that Ocracoke embraces its biking culture, and many local stores and restaurants have more bike racks than parking spaces. In fact, if you're planning a long vacation to Ocracoke Island, bringing or renting a bike is a must, as it is truly the easiest way to navigate the small and crowded streets. Remember that on all bike paths pedestrians have the right of way, and you should always travel on the right side of the road, with traffic. Please ride single file on bike paths, and be sure and wear a helmet. If riding at night, a lighted white light in the front and a lighted red light and/or a red reflector on the rear is required. Please be mindful of other vehicles and bikers, and never drink and ride, as the same laws that apply to motorists also apply to cyclists. If you're riding in unpopulated areas or on long stretches of highway, such as Pea Island National Wildlife Refuge, or the stretch of NC Highway 12 towards Ocracoke, be sure and pack plenty of water and snacks, as there are limited strops and resources available in these areas. For summer and shoulder season rides, you may want to bring bug spray, particularly though woodsy or marshy trails where mosquitos can be thick. 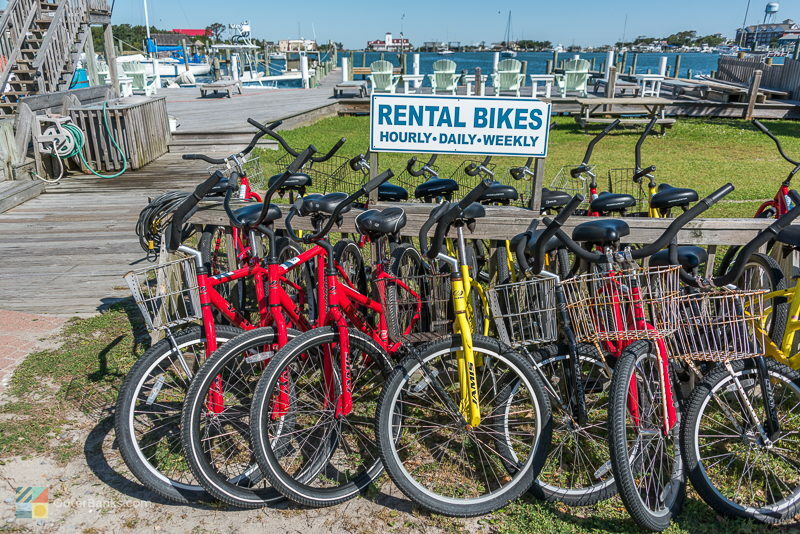 You'll find no shortage of bicycle rentals on the Outer Banks. Major chains such as Ocean Atlantic Rentals and Moneysworth Rentals offer daily and weekly bike rentals, and also delivery to your vacation rental home. There are also a number of small bike rentals and shops, like the brick red Bike Barn off of the bypass in Kill Devil Hills, or Island Cycles in the Food Lion shopping center in Avon. Generally, bikes are rented on a daily or weekly basis, and of course, you can always bring your bikes with you on your vacation. While some vacation rental home communities may have restrictions on motorcycle or motor home parking, there are no restrictions for bikes. In fact, some vacation rental cottages even offer bikes to vacationing guests. Check with your vacation rental management company to see if they have any homes that offer bikes as an amenity. 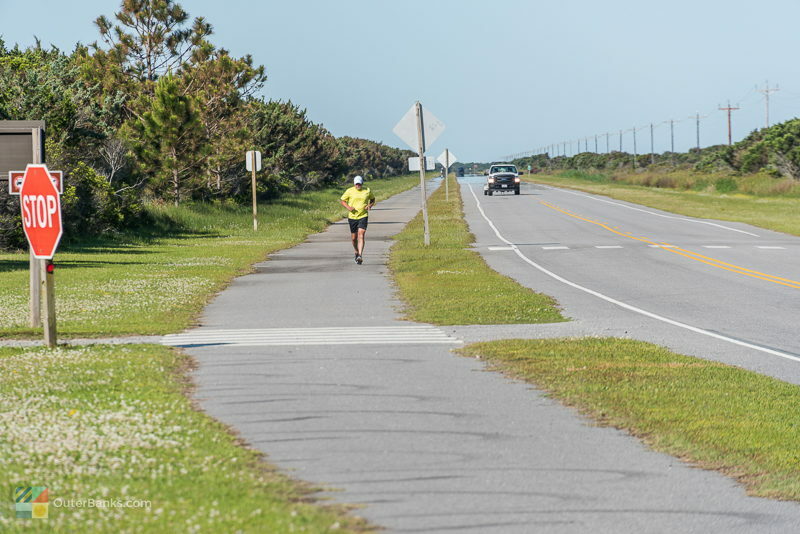 While it's not unusual to see a cyclist or two in local 5K runs, biking the entire Outer Banks is one of the extreme attractions for dedicated cyclists. 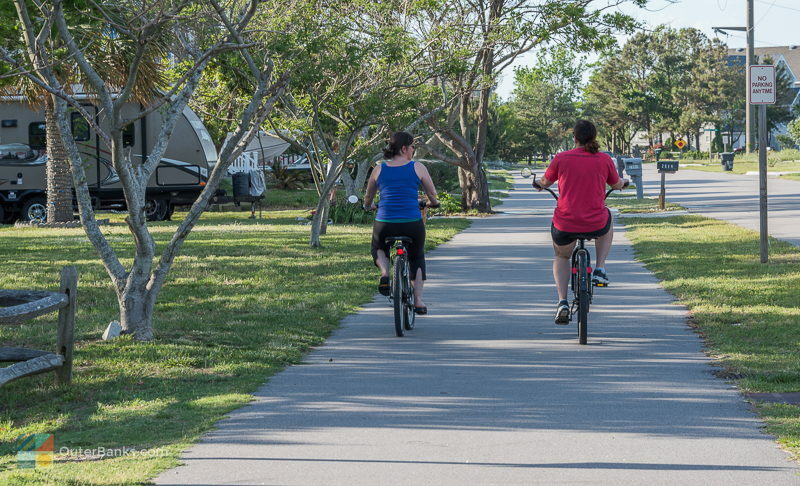 Several organizations offer "Bike the Outer Banks" tours, which are weeklong events that stretch from Corolla all the way to Ocracoke and even the Southern Outer Banks, and include lodging, food, and tour guide leaders to point out attractions along the way. For extreme sport lovers, the annual Outer Banks Triathlon, typically held in Manteo in the Fall, is the ultimate test of endurance as participants undertake a 13.1 mile run, a 1.2 mile swim, and a 56 mile bike ride. For folks who love the action of a triathlon bur prefer a gentler experience, participants can also do a "Sprint" triathlon with a 750m Swim, 13.5 Mile Bike, and a 5k Run. Either way, you're guaranteed to test your limits while exploring all areas - sand and sea - of the Outer Banks. 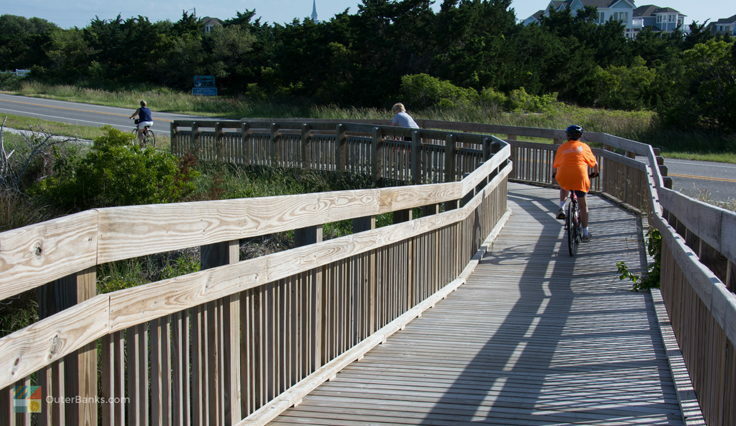 The Outer Banks has a virtually limitless supply of landscape to explore on a bicycle. Cyclists can choose from paved paths adjoining the main highways, or opt for small wooded trails that are literally off the map. Regardless of where you explore, and whether you rent or bring your bikes along, a long bike ride along the 'banks is an ideal way to spend a breezy vacation afternoon.